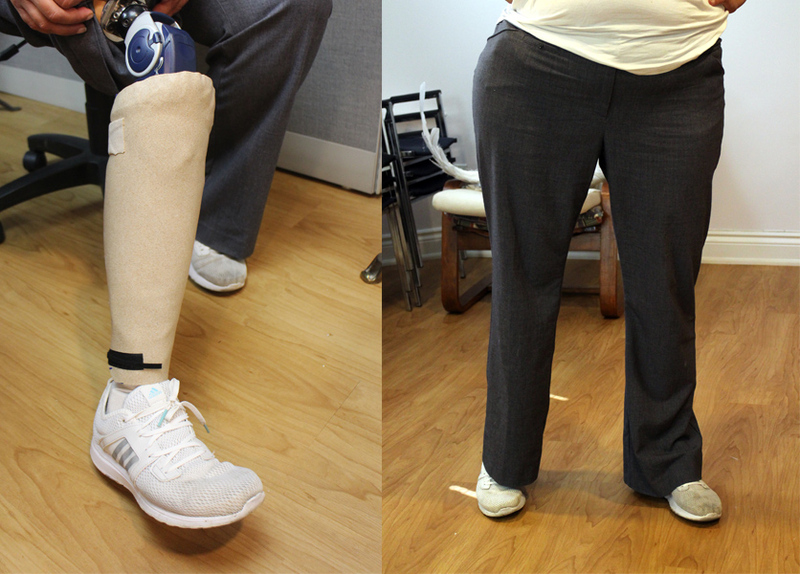 Prosthesis can leave a lot to be desired, especially when worn under clothing where the silhouette is changed due to the void of space. This can be specially noticeable when walking or when wind is pushing against fabric. One of the folks at our receiving warehouse has a leg prosthesis and mentioned the cost of a ‘shell’ cover was prohibitively expensive. When she asked if we thought a Worbla cover could be made for her, we decided to give it a try! This was our first ever attempt and had to be done in very short sessions, so don’t think this is the only method – this is just a base idea you can expand upon! Step One: Making a tape duplicate of the body part. We wrapped our model’s other leg in cellophane and then masking tape to get the basic shape we’d need, then transferred that to Worbla’s Mesh Art. We chose Mesh Art because it’s the most durable of Worbla products. Note: Obviously this would give us two left calves, but the difference under clothing was not particularly noticeable. We cut out our Worbla and heated it over a piece of parchment paper (to keep it from sticking to our table). When it was fully heated and soft, we let it cool enough that it wasn’t too hot to touch, and then wrapped it around our model’s leg. It’s important to be careful of the heat! You can wear an old sock over the skin to keep it insulated if you are very sensitive to heat. Mesh art is very sticky and can leave residue, so don’t use anything you don’t want to risk getting damaged as a buffer layer. Once we had the piece shaped, we trimmed it down and folded over the edges at the top for additional strength. 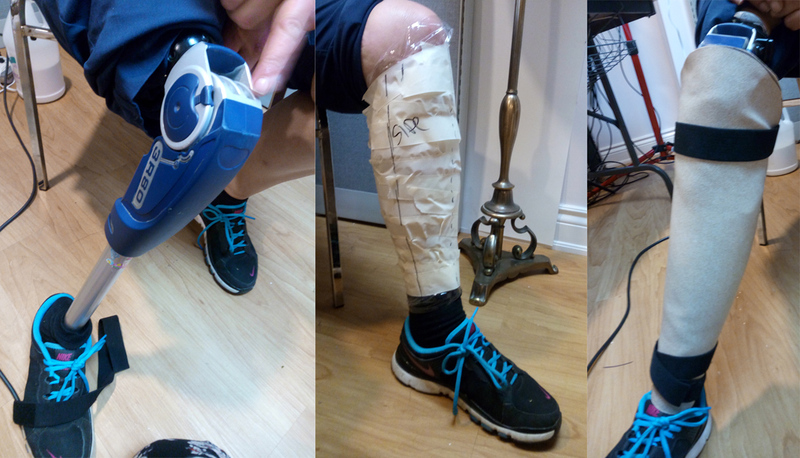 Our model’s prosthetic, the tape double of her other leg for the pattern, and the formed worbla wrapped around the bare prosthetic – clearly too small, but a good start! We needed something to bulk up the prosthetic leg, and went for as simple and easy as we could: 1/2 inch floor mat foam, cut into 4 strips. We hot glued 2 together (I actually suggest contact cement for a better bond) and added elastic and hook and eye tape for strapping. 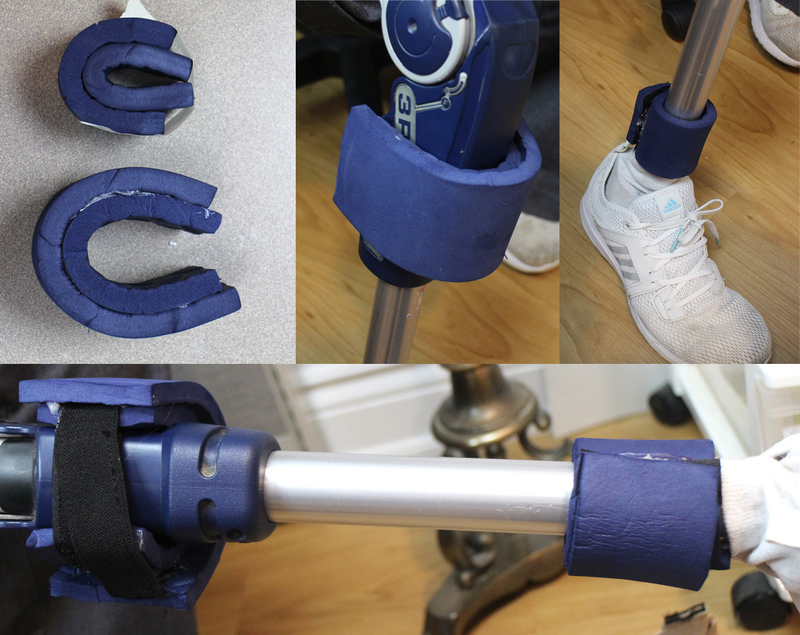 This allows our model to add the shell when she wants to without permanently modifying her prosthesis. 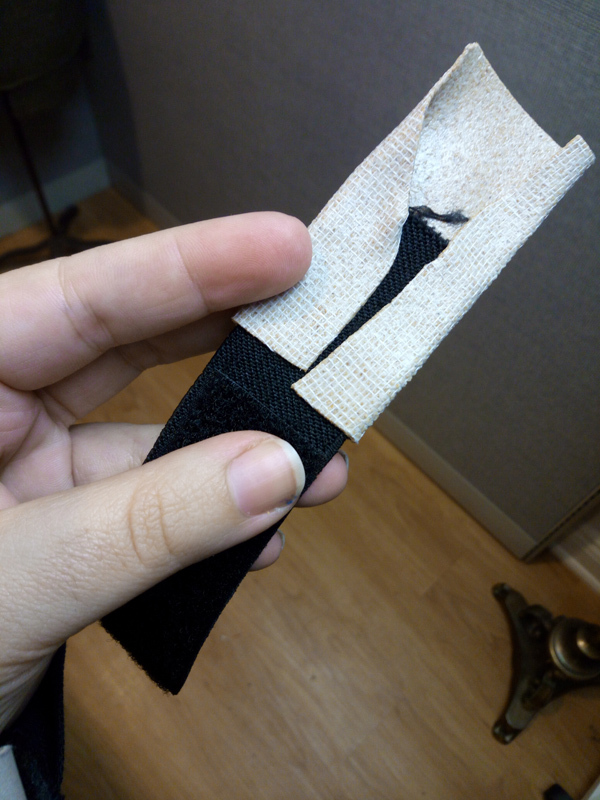 Again, as simple as we could go: Hook and loop tape on elastic. We added this by using hot glue to attach the elastic and then layering a piece of Mesh Art over that, the smooth (glue) side down. This created a very strong bond where we didn’t have to worry about the elastic pulling away with use. 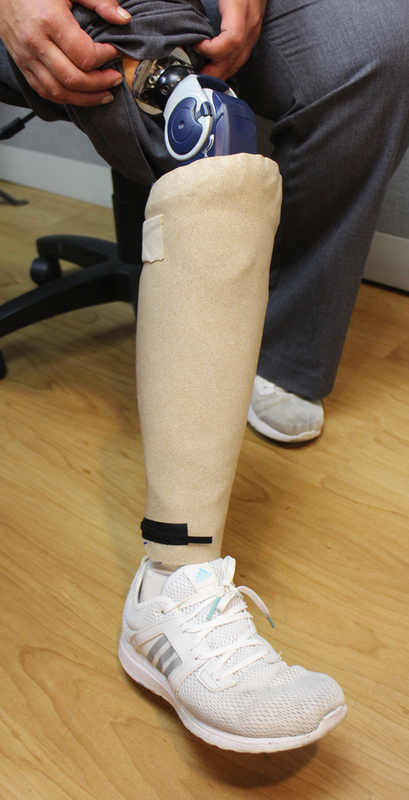 The shell of the leg and the hook and loop tape with elastic attachment. You can see the top edge of the Worbla was folded down for a smoother finish and added strength. For a super strong bond, we wrapped the flastic in Mesh Art first, then attached that to the shell. The adhesive in Mesh Art is so strong we didn’t have to worry about the elastic pulling out with use. The finished product isn’t perfect but it does the job of filling up our model’s empty space around her leg and was done with a medium sheet of Mesh Art. 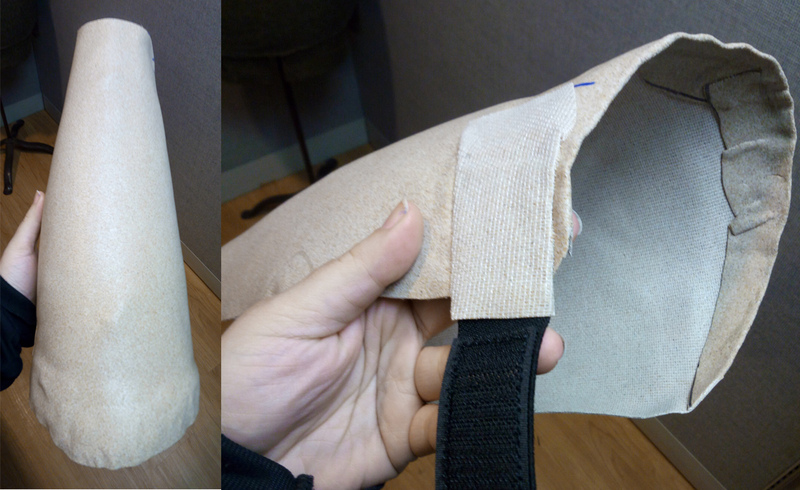 It’s lightweight and the cost including elastic and hook loop tape was under $50. And of course you can paint it with spray paint, acrylics, or cover it with fabric to add your own flair!